Regina Doherty got into a heated debate with the Sinn Féin leader. SINN FÉIN LEADER Gerry Adams has condemned a death threat made against Fine Gael TD Regina Doherty. Following a heated debate with Adams on LMFM earlier this week, Doherty reportedly received a series of abusive messages including one threat to slit her throat. The Irish Independent has reported that gardaí are investigating the incident. When Adams recalled how he and members of his family have been attacked, the Meath East TD said it was brought on by his actions. Doherty and Fine Gael have not responded to requests for comment on the issue. Speaking at the party’s final press conference before Friday’s election, deputy leader Mary Lou McDonald said she doesn’t “accept for a second” that people won’t vote for Sinn Féin because of the party’s link to the Troubles. 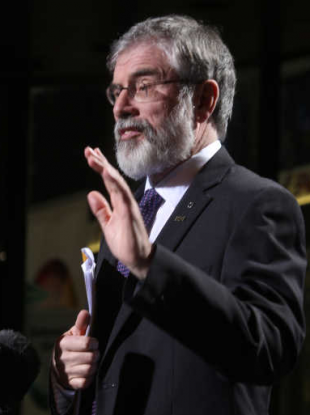 Meanwhile, Adams denied he is unsure of Sinn Féin’s figures. Email “Gerry Adams condemns death threat made to Fine Gael TD”. Feedback on “Gerry Adams condemns death threat made to Fine Gael TD”.